Sleep isn’t something that can be hacked. You either get enough or you don’t, and it’s either good quality or it’s not. Wearable trackers and pricey meds aside, the only thing that matters is feeling rested and ready in the morning (and if this is you, best keep that on the down low). Daylight Savings Time robbed us of an hour last weekend, but often it isn’t so clear what went wrong with last night’s sleep. We all know the basics: Screens in the bedroom are a bad idea, as are too much caffeine or alcohol and every night, around the same time, we should head to a quiet, dark place and lie there for about seven hours. The guidelines seem simple, yet following them doesn’t guarantee an energetic start, or that dawn won’t bring a new backache or neck kink. Most Canadian sleep specialists have a waiting list of six months to a year of desperate patients trying to figure out the secret to waking up rejuvenated. Sometimes, it’s easy to overlook the obvious: When seeking out a better sleep, start with the bed. After all, says Dr. Elliott Lee, a sleep specialist at The Royal mental-health centre in Ottawa, we (ideally) spend a third of our lives sleeping. “It’s a structure that warrants a proper investment,” he says. To help you make that investment, we sought advice from a roster of opinionated sleep experts. They’ve got tips for light sleepers, sweaty sleepers and the long-suffering partners of tossers-and-turners alike. If your bed is the problem, we’ll help you fix it. Milan says that discussing a patient’s mattress and pillow set-up is “100-per-cent crucial” to eliminating pain, which is why he often asks for a photo of their bed to analyze. An average mattress life span is between 10 and 20 years, he says, and if your sleep is restless or you’re experiencing pain or numbness, it’s time to consider a new one. When test-sleeping, take off any heavy coats or jackets, and be prepared to lie on a potential mattress for at least 15 minutes (this is the only time you’re allowed to use your phone in bed). “Don’t be fooled at first by an extra-cushy foam top,” he says. Comfort is crucial, but lack of structural support will cause pain and stiffness over time. A mattress should hold the spine in as close to a natural position as possible, softly filling the curves at the lumbar spine and rib cage. It should be supportive, but not so hard as to put painful pressure on the hips or shoulders. Get a friend or partner to spot you: You want to be cradled. Oh yes, partners, the cause of one of the most common complaints – bed sharing. Generally speaking, one half of a couple is the Goldilocks, always fussing about too hard or soft, and their kicks and jerks cause the mattress to bouncily wake the other. “It can be quite problematic,” says Lee, also an assistant professor in the department of psychiatry at the University of Ottawa. He recommends earplugs and white-noise machines for light sleepers with restless partners. Up to half of his patients decide they can’t sleep with their partner, at least on nights when they need a really good rest. There are a few things to try before resorting to marital bunk beds. Jory Solomon, a sleep expert with mattress retailer Sleep Country Canada, says that in industry parlance, this is known as “motion control.” To get more of it, most buyers are moving away from traditional mattresses that contain one long, continuous wire coil. “If one person moves, you definitely feel it on the other side,” he says. Pocket-coil mattresses, in which each coil is individually wrapped, reduce the amount of residual bouncing. The greater number of individual coils, the more motion control for each sleeper (and the more expensive the mattress). Greater motion control is also behind the rise in popularity of foam mattresses, Solomon says, although some people don’t like that these newer, techier beds don’t have any bounce at all. At Dormio Organic Beds in Toronto, couples can design custom beds that are softer on one side than the other. Owner John Aprile started the company when he couldn’t find an environmentally friendly bed – “memory foam is a chemical soup,” he says – that was actually comfortable (“the first organic mattress I tried felt like a futon”). Most Dormio mattresses get their firmness from a latex core and are covered in varying layers of wool for comfort and natural flame retardance. They’re at least twice as expensive as a basic Sealy or Serta, but Aprile says they’ll last 20 years. Fewer layers of wool on one side makes for a firmer sleeping experience, and hopefully, a bed that two people can happily share. All linens available at Hudson's Bay. Maybe it’s the lack of alarms and meetings that make a holiday lie-in so dreamy, or maybe it’s the pillow. Increasingly, upscale hotel chains are selling guests a selection of head cushioning to take home after a restful stay. Visitors to certain Fairmonts, for example, can go with the hypoallergenic Xanadu, made from bamboo and charcoal and said to help with snoring, or the Dreamsong, filled with classic white down. 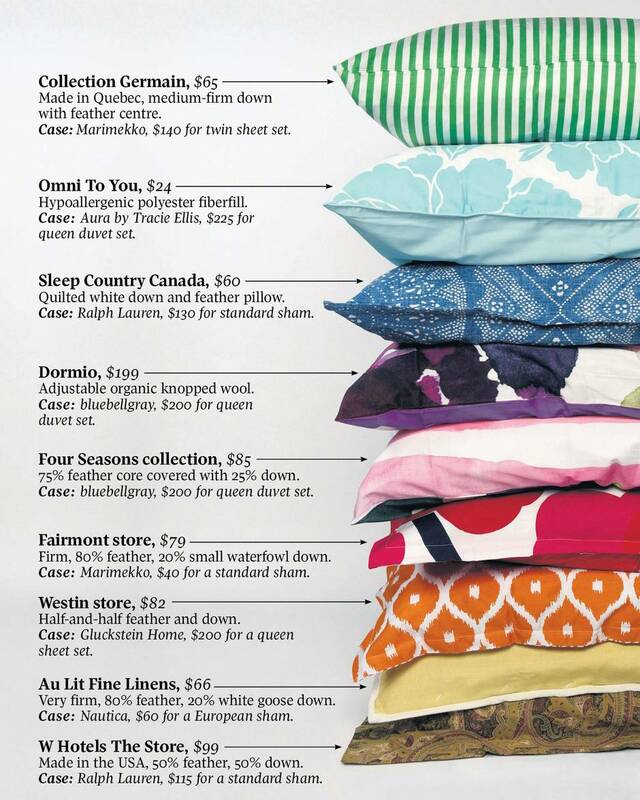 Her Toronto store carries 100-per-cent “super-squishy” down pillows; firmer feather-and-down mixes; and hypoallergenic synthetic options, in which the fibre fill is blown with a fan into the pillow to make it almost as lofty as down. The $361 Lausanne has a 500-thread-count shell and is filled with highest-quality European goose down (apparently Continental birds are softest). Nothing at Au Lit has feathers or down from live-plucked birds, meaning your conscience can rest as easy as your head. As with mattresses, the purpose of a pillow is to support your natural shape. It should fit neatly into the curve of your neck, preventing it from sagging as you sleep. Shorter people have less of a curve to fill, and sleep position is an important factor. “A tall guy who sleeps on his side will need an equally tall, high-loft pillow,” says Sleep Country’s Solomon. At Dormio, some of the pillows have side openings so that users can add or remove knops of organic wool until they find the perfect height. Aprile recommends using a process of elimination to choose from his ample selection, but admits the process can be overwhelming for people. “Buying a car is easier,” he says. So don’t be embarrassed to just lie there, feeling it out, for as long as you need. He’s used to it. Lee has good news for front sleepers who are often admonished for the pressure they put on their lower backs. Front sleeping can actually be beneficial for those with sleep apnea, since it minimizes the gravitational pull on the back of their throat that contributes to snoring and broken breathing. To avoid back strain, try a thin pillow under the stomach. Milan, the physiotherapist, does caution that front sleeping requires a fairly extreme turn of the neck, which can cause a world of hurt. Go with a really, really skinny pillow under your head, and get ready to accept that front sleeping might not work for you. “Sleeping habits are really tough to change,” he says, “but usually the pain will guide you." Goodman is pushing back at the linen lingo backlash: “thread count” and “Egyptian cotton” do matter, she says, even if they’re overused phrases. Anything under 200 threads per square inch is simply too rough for a good sleep, she says, and beyond that people need to know how the numbers on the package line up with personal preference. A 220-thread-count sheet feels fresh and crisp; those who like a silky feel should go as high as 610. And, yes, any number higher than that is probably a bit of a gimmick. As for Egyptian cotton, it’s simply the softest, most luxurious sheet material she knows of. But it has to be 100-per-cent Egyptian, not a blend, and woven on quality looms. “In Italy, they’ve been weaving for hundreds of years,” Goodman says. “Portugal and Switzerland, those are good, too.” Cotton is by far her favourite bedding material, though Au Lit also carries silk pillowcases advertised as containing amino acids that protect fancy hairdos and prevent fine wrinkles. And, when the mattress, pillow and sheets are chosen, it’s time to top it all off. Again, Goodman is a traditionalist, favouring pure down comforters in various weights for both a heavy snuggle in frigid temperatures and a light embrace in warmer weather. Silk duvets are another luxe option for those with allergies, she says, offering all the warmth without any of the sneezing. A drop in core body temperature is pretty much mandatory for human beings to fall asleep and stay there. It should happen naturally but is easily disrupted, especially for women, whose hormone fluctuations before and after menstruation, pregnancy and menopause often come with increased heart rates. The result: waking up flushed, overheated and cranky, usually covered in sweat. Bed and bedding manufacturers are turning their minds to this common complaint. “In the last three to five years, this is where the most change has occurred,” says Jory Solomon, a sleep expert with Sleep Country Canada. From the mouths of some of the country’s greatest sleep minds, here’s how to get a nice, cool rest. Take a hot bath. Raising the core body temperature slightly before bedtime prompts it to drop down when you want to drop off, says Dr. Elliott Lee of The Royal mental health centre in Ottawa. Try a cooling mattress pad. Solomon recommends the Coolmax brand, which is covered in a wicking fibre that moves sweat away from the body. Lee suggests the ChiliPad, an electric mattress pad filled with water that can either heat or cool the bed, but cautions that he’s heard both positive and negative reviews. Use lower thread-count sheets, says Joanna Goodman of Toronto’s Au Lit Fine Linens, or try linen sheets, which have a rougher weave. Solomon advises the use of bamboo bedding since the plant has a loose, open-celled design. Goodman also recommends super-soft Lusomé pyjamas, invented by a Canadian woman whose sister was suffering night sweats during chemotherapy. The clothing has undergone a chemical-free treatment that helps spread moisture quickly through the fabric, allowing it to evaporate faster. Stick a foot or two outside the covers. Your feet are key to natural temperature regulation, and are covered in blood vessels called arteriovenous anastomoses, which help dissipate body heat.